Daf. 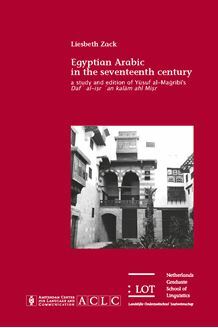 al-i.r .an kalam ahl Mi.r, “Removing the burden from the speech ofthe Egyptians” , was written in 1606 by Yusuf al-Maribi (d. 1611), andprovides its readers with valuable information about the Egyptian dialectused in the 17th century. The work is unique because it was one of theearliest attempts to study colloquial Arabic. It is a list of Egyptian Arabicwords, which al-Maribi checked for consistency with Classical Arabic. Hisaim was to prove that many Egyptian dialect terms, which were consideredto be “incorrect” Arabic, in fact had their roots in the Classical Arabiclanguage. Al-Maribi focused on the words used in daily Egyptian life, suchas the names of tools and utensils and food and drink, as well as the speechof traders and artisans. These entries are often adorned by anecdotes andlines of colloquial poetry and therefore, provide the reader with insight intothe culture and daily life of Egypt in this period. This volume consists of twoparts: the first is a study of aspects of daily life, the colloquial poetry, thelinguistic characteristics of the dialect of this period, and a glossary of thewords which are mentioned by al-Maribi and the second includes anedition of the Arabic text, based on the autograph.